Battle for liberation of Kiev. 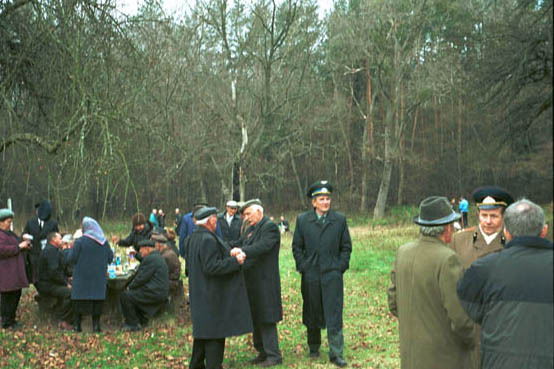 A photo showing veterans celebrating town liberation day. Each year fewer are alive to attend these picnics. Soon none will be left who can tell, in their own words, the truth of war. They alone remember how war was fought before the atom, before terrorism, before mercenaries. They are simple, brave soldiers who did their jobs every day, for four long years, without any pay. The major crossing over Dnepr began on November 4th, 1943. The name Luteg beachhead comes from name of a village where Soviet Army first broke through German defence. Battle spread on area of 70 kms along the bank of river North from Kiev. Troops start coming from everywhere. In Bukrin they left dummies of planes, tanks and cannons and in one night secretly re-deployed army. There were partisans from Belorusia, there were troops and people from all part of Russia and central Asia, Ukrainian civilians from the left bank of the Dnepr river or just anyone who could hold weapon and whom Red Army picked on their way. Luteg beachhead was a scene that town haven't seen since Mongols invaded it, thousands of people were crossing river on boats, horses and bags of straw. People were coming and coming and soon Germans, no longer able to hold this avalanche, stood back. Photo from diorama in museum. It was one heavy battle. Only river know how many died, water in river was red with blood. We lost this battlefield, after war they built a hydroelectric power station and all area of a beachhead went under water. Only top sides of bunkers stand out, they are bunkers of fortified area. Stalin desperately wanted Kiev to be liberated by November 7 and it was destined to happen. On November 6, (1943) Germans left Kiev. The commander of German army group "South" - Eric Manstein- had a broader agenda other than to merely ruin Stalins celebration of Revolution Day. Germans began retreat on the west and enticed the Soviet troops to chase them. Tens of thousands took the bait and actually strayed as far as 100 kms away from the rest of their comrades. Then the Germans launched a crushing counter attack at a town called Zhitomir. Thousands of Soviet tanks were destroyed, along with their crews. Germans advanced right up to the city walls, but were unable to break through that line of defense and take back the city. Why not? On the other side was the main Soviet army, experienced, well trained and better armed then they were in 1941. Click Here to proceed with war photos and videos of military archaeology.